Tall Case, Steam Locomotive Clock. 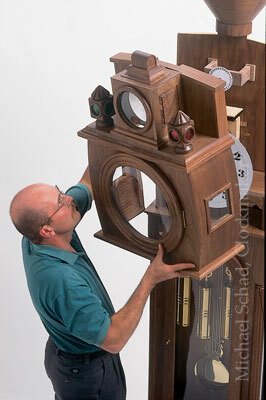 Custom weight driven grandfather clock. Limited edition of three clocks. • The highest quality black walnut casework. • Custom mechanism tolls the hour by blowing train whistles twice and ringing a brass bell. • Day of the month is displayed in the center of the reflector above the dial. • Fine brass inlay detail in doors and headlight bezel. • Side windows allow you to watch the mechanism in action. A rare timepiece of the highest quality that your family will treasure for generations to come. 94-1/2 " tall x 22" wide x 15" deep. Each clock is signed, numbered and includes a certificate of authenticity. Cost $12,500, plus delivery and set-up. This clock was exhibited at the world's largest model train store, Caboose Hobbies, Denver CO.